It's time for As of Late! My dear, amazing friend Christy hosts this monthly meme (rhymes with cream) on the third Thursday of each month. It's a great way to look back and contemplate how things have been for you lately. 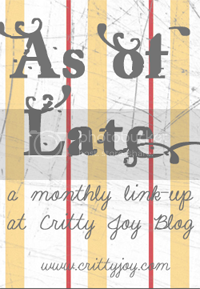 So, after you read MY post, be sure to stop by Critty Joy and read hers and the other participants' (they're generally VERY quick reads) - and join in yourself if you want! LATELY, I've felt like a headless, emotional, scattered chicken more often than not. LATELY, I've been loving this book (almost done!) and looking forward to this one (by the same author!) - even though it's not next on my "to read" list. LATELY, I've been in denial that my oldest will actually be starting middle school next year. LATELY, I have become more and more in awe of Margie Lawson. LATELY, I have become more and more aware (thanks to the lady above) how much work I have to do on my biblical fiction before it is as good as I can make it. LATELY, I haven't had time to do the work I need to get it as good as I can make it - but I AM learning the skills I need! LATELY, I've been keeping a secret (by necessity) and have been impatient to be able to share it (and I will - soon, I hope) - it has nothing to do with me being published, by the way. LATELY, I have felt blessed by two different, but wonderful, groups of four women I belong to. LATELY, I've seen more cute babies at Meijer than I thought possible. So, tell me - what have YOU been doing as of late? Be sure to stop by Christy's blog for more As Of Late. Thank God for the blessings. I know that chicken thing well. Sigh. Yay for learning more about your craft...even though it can be hard a times. A secret? Ohhhhh. I like secrets. It is so fun to read about Meijer on your blog -- I grew up in Michigan but then have lived in Virginia, Nashville and the Rockies in Colorado -- Meijers is so near and dear to my heart!